Nearly a full month removed from their last victory, plenty is being said of the Sabres express trip to the NHL’s basement. The ethics and direction of Buffalo’s season bring about accusations and arguments over tanking, the skillset of the head coach and the ability of Tim Murray to move the Sabres from cellar dweller to contender. At this point of the season the Sabres are nothing short of a roaring dumpster fire. The scalding hot play of Jhonas Enroth, Tyler Ennis, Zemgus Girgensons and Matt Moulson – the quartet that helped power their late November surge – has all but disappeared while the rest of the roster has been battered by injuries. With the roster limping around, the tactically feeble head coach has been unable to find a way to turn around Buffalo’s month-long slump and the team’s slow starts and weak finishes should bring about question surrounding his famous motivational skills. The result of Buffalo’s 11-straight regulation losses is a spot in 30th place and an increasing probability that they’ll be the proud owners of the highest or second highest chance of drafting first overall. As is widely known, finishing 30th guarantees the Sabres the opportunity to draft Jack Eichel as a consolation if their 20% chance at winning the lottery doesn’t pan out. While a grand debate has raged all year over the ethics and logic surrounding the push or hope for the first overall selection, it would seem that far too many individuals who follow the Sabres have ignored the arsenal that Tim Murray has at his disposal. While getting McDavid or Eichel remains up in the air, there is little doubt that the 2015 Draft will represent the point in which Murray puts the pedal to the floor on this rebuild. Murray’s efforts at last year’s deadline and even the efforts of his predecessor, has provided the Sabres with a plethora of future and current assets for which to manipulate their roster with. In fact, you could form an entire roster based off the prospects Buffalo has in the AHL, major junior, Europe and the NCAA. You would actually need to make cuts because of the depth of the prospect pool. Buffalo’s prospect pool, which is already at unparalleled heights compared to the rest of the league is set to grow even deeper as the Sabres are currently set to add five more players in the Draft’s first 60 selections; four of which would come in the first 31 picks if the Draft occurred today. Not every NHL draft pick is a guarantee to make the NHL. There’s a strong possibility that some of Buffalo’s prospects, even those considered to be blue chips, will never don an NHL sweater but that’s the nature of talent development in the NHL. Buffalo’s advantage is the sheer numbers they have when it comes to their A-level prospects. Depending how you count them, the Sabres have well over 30 prospects in the pipeline. Of those 30-plus bodies, 15 were picked in the first two rounds of the draft and you could make an easy argument that Nick Baptiste and Hudson Fasching have done quite a bit to push their stock close to that of a second round prospect. That means Murray will have 20 (or 22) first or second round prospects in the system if he keeps his picks this summer. Those 22 bodies (counting Baptiste and Fasching) are complimented by the likes of Zemgus Girgensons, Tyler Ennis and even Matt Moulson as some of the few players on the current Sabres roster who can be penciled long-term. That is a massive arsenal of assets that Murray will have in the organization and it will give him a great deal of flexibility down the road, specifically in trade talks. There are going to be question marks around each and every player in the pipeline who hasn’t seen a minute of professional hockey, let alone an NHL game. While players like Mikhail Grigorenko and Joel Armia have made tremendous strides in Rochester this season, they’ll still need to make another adjustment if they’re in Buffalo next season. The same can be said of Justin Bailey, Baptiste, Fasching (should be be signed) and even Brendan Lemieux although he isn’t AHL eligible. Simply shouldering the expectation for a turnaround in 2015-16 on the shoulders of first and second year pros is foolish and massively shortsighted. What is far less shortsighted is moving forward with the understanding that Murray have the ability to leverage the mountain of assets the team controls to bring about more immediate change for both the long and short term. Despite Buffalo’s horrid record, Murray is perfectly positioned to utilize the blue chip talent within the organization to manufacture trades for difference makers. There is a ton of precedence of NHL teams utilizing NHL assets and highly valued picks and prospects to acquire impact players. It’s the core concept of the trade deadline and an ever growing trend of mid-summer trades. For example, the Kings sacrificed Jack Johnson and a first round pick in order to acquire Jeff Carter. The Rangers gave up Brandon Dubinsky, Artem Anisimov, Tim Erixon and a first round pick in order to bring Rick Nash into the fold. The Rangers also turned around and dealt Marian Gaborik and some spare change to bring in Derick Brassard, John Moore and two more pieces in a move that saw them recoup some of the quality depth they dealt to get Nash. In each case you see a team sacrificing a quality piece in order to bring in a bonafide difference maker. 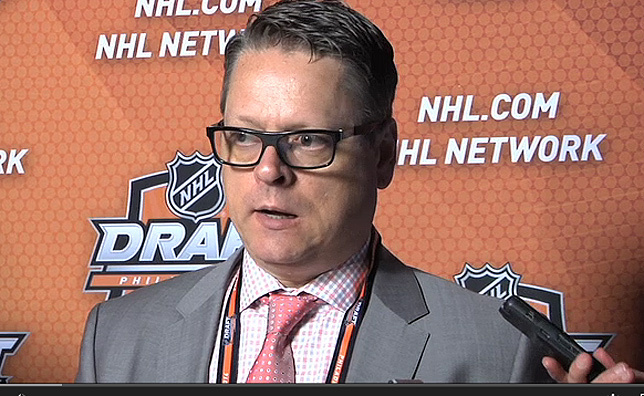 Tim Murray is well positioned to execute the type of trade that brought Tyler Seguin to Dallas. Obviously the primary difference here is that those were all contending teams trying to find that one last missing piece of the puzzle, the Sabres aren’t even in that same universe as they stand today. However, a move along those lines (think the Tyler Seguin trade) would immediately accelerate the rebuild effort. Without diving too far off the deep end when it comes to hypothetical trades, it’s easy to look at Buffalo’s roster of current and future players and realize that Murray has more than enough to offer on the open market. If Tyler Myers is indeed on the block, it would be easy to pair him with Buffalo’s 2016 first round pick (or even the St. Louis or Islanders first) and a prospect to attempt to pry a young, proven scorer from another team. The contention that simply drafting first will be all that’s required is a foolish sentiment. There’s far more that goes into the Chicago, Los Angeles or even the Pittsburgh model of building a champion and it’s something that’s been covered in this space before. One player won’t be enough to turn around the Sabres, even if his name rhymes with Schmcdavid. But when you factor in Buffalo’s prime draft position and the ability to leverage other assets for NHL talent, the turnaround can come about much quicker than it will take for every single organizational asset to be NHL ready. The only true question mark surrounding this entire scenario is not which prospects will develop into better pros, but how savvy of a negotiator Murray is. One of Darcy Regier’s more respected strengths – from many I talk to – was his ability to make balanced trades that almost always addressed Buffalo’s organizational needs. So far Murray’s trades are all too fresh to identify as true wins or losses and he’s on the verge of needing to make a few more in the very near future. Is he capable of pushing the right buttons and maybe even making the right calculated risks on the trade market? Everything I’ve seen from Murray when it comes to transactions tells me he makes calculated decisions and is never backed into a corner. There’s no way to say if he’d pull the trigger on a deal like the one that brought Tyler Seguin to Dallas, but you can’t deny he has the assets to make that kind of trade in order to kick his rebuild into high gear. What I can say definitively is that Murray will be dealing from a position of power at the deadline, draft and beyond and it’s foolish to overlook the foundation that has been set for the Sabres’ future.